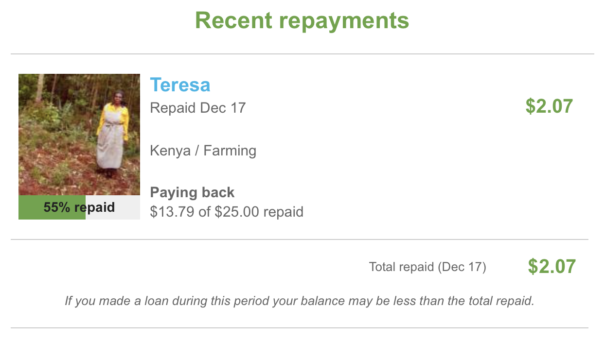 I got this email from Kiva today. They do micro-financing for people in countries where it’s virtually impossible to get a bank loan. Last summer I decided to put a little fund together and let my nephews go through the site and decide who to lend money to. I told my sister I want them to be good investors. So we’re sitting at the kitchen table and going through the site and reading the descriptions of the people who are trying to grow their business. They don’t care about business plans or burn rates or anything real investors care about. But their method seems to work, we’ve only had one default. Okay, why am I telling you this? I’m telling you this because I’m not telling my sister my secret motive: I want them to see how the other half of the world lives. I grew up in a Midwest suburb, went to a Midwest college, got a Midwest job. I didn’t see how the other half of the world lived until exiting a plane in Ghana at age 28. Over the years I’ve traveled to many other countries equally amazing yet poor, and learned when you compare yourself to the rest of the world it’s a useful trick to feel rich. Here’s some facts. The one percent in the U.S. earn $380,000. Compare yourself to this one percent and you probably don’t feel very rich. But what if you compared yourself to the rest of the world? You’re in the one percent if you earn just $34,000, and you’re in the top 0.1% if you earn $70,000. If that’s supposed to make you feel rich, then why does your bank account tell a different story? Well, if you want to be rich, you have to spend less than you earn. Look throughout history. Benjamin Franklin and John D. Rockefeller both became rich by being thrifty, and it’s hard to argue that isn’t the same trait used today. What he’s saying is being rich is about living within your means, and learning to be happy living within your means. In fact, studies show a family only needs $75,000 to pull that off. Which means if you’re earning more than that, not only can you be happy and feel rich, you ironically become rich. Then why aren’t more people becoming rich? It’s because living within your means is hugely unpopular. The social pressure to keep score with how fancy your car is, the number of carats in your ring, the square feet of your house, is really powerful. So here we are. It’s popular to say, “I want to be rich.” People tell me that all the time, and I tell them to start by cutting out something small. They tell me that’s impossible because they’ve cut everything to the bone and so my advice doesn’t apply to them. These people are delusional. Yes, I know there are exceptions, but what they’re saying is that every single thing in their standard of living is more important to them than what they say they want. And that’s fine, but don’t complain to me that the advice doesn’t work. It does, you’re just choosing to do what’s popular, and doing what’s popular will never make you rich.